There is a lot of controversy surrounding the recent move to make Scrapie testing mandatory in goats. 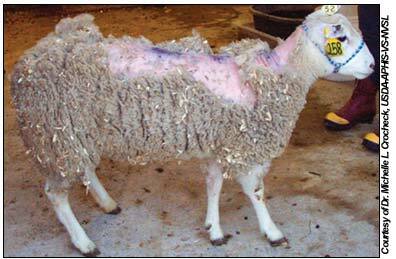 Scrapie is a disease primarily of sheep, and only seven cases have been diagnosed in US goats through 2011. Why make us go through all the hassle? - Scrapie is a devastating and horrific neurological disease. 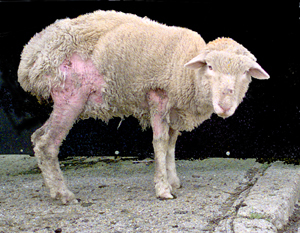 I challenge you to view the images below of sheep manifesting clinical symptoms without being shocked and deeply moved to protect your own animals. - Scrapie represents immense economic impact both domestically and internationally. It has already impacted the ability to sell genetics overseas. - Because it is a TSE (transmissable spongiform encephalopathy, it shares many characteristics with BSE, the condition linked to new variant Creutsfeldt-Jakob disease, commonly known as "Mad Cow Disease." You can see how this could impact how the public could view TSE in sheep and goats, if breeders and commercial producers are not shown to take it seriously. - The disease can be contracted and carried by goats, which may not manifest symptoms for years, if ever. I would far rather cooperate with testing and eradication of Scrapie than put my herd and thousands of others at risk. Contrary to popular thought, and the origination of much resistance among goat breeders, show goats do NOT have to wear ear tags - official tattoos and official electronic information will suffice, when accompanied by the appropriate certification. Scrapie gets its name from the common clinical symptom of an animal scraping off its wool or hair due to the neurological irritation. Other clinical signs include: weight loss, behavioral changes, "hopping" movement in hind legs, high-stepping gait in forelegs, swaying of the hind end, loss of coordination,tremors, sensitivity to noise and movement, biting at sides or hindquarters, weakness, recumbance, death. There are a LOT of useful links and files here. Organic Consumer's Association - Stop the Madness!